This is the third in a series of posts describing my recent trip to England, Ireland, the Netherlands and Wales, from writing course to school reunion and more. We might have met once as children, but N is ten years younger than me and we wouldn’t have had much in common then. She found me recently on Facebook, unsure who I was but knowing my name was somehow connected to her family. “We’re second cousins,” I wrote back, and we became friends. She sounded pleasant, but it was with a little trepidation that I waited for her to pick me up from Totleigh Barton, along with her husband and son. I needn’t have worried. They sped me away, along narrow windy roads, from all the tension of the writing course, and chatted away in a very friendly manner. “We do have wider roads in Devon,” N’s hubby assured me later on. “We just haven’t been on any.” It was probably good for me not to have time to dwell on my performance at the course. In fact, I was so busy for the rest of my trip that I didn’t reflect on the course until I returned home. 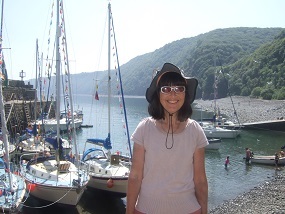 They took me to Clovelly, a beautiful fishing village accessed by walking down a steep cobblestoned path. Vague memories of having been there before hovered around me. My parents probably took me there one summer when we stayed in Torquay or Ilfracombe. I probably complained about the walk back, up the hill. While in the village, we had cream tea. This is one of the things I always like to do when I’m in England, and what better place to do it than in Devon, home to clotted cream. We also walked along the sand and pebbles of Westward Ho beach, and later took their two dogs for a walk in the forest by their house. In the evening, N and I talked families. She drew me a family tree and told me about the people in it. I did the same. My tree was much larger. My arm looks burnt in this photo, but it’s really tanned. 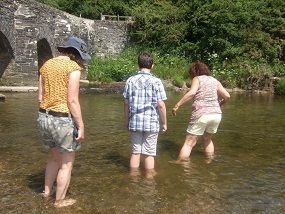 The next day, we enjoyed another country walk, and a wary paddle on stony ground, before I caught the train back to London, to the house I stayed in before the course. This time it was full of people. Clovelly! It’s one of my favourite Devon villages. I know it’s full of tourists, but it’s such a pretty place. And all the better from seeing it with newly-discovered family! I’m glad I didn’t have to drive along them! How lovely to have connected with your cousin this way! I don’t know Devon at all although I think I may have visited as a child, I don’t remember… but I hear it’s beautiful and it looks like you had a good time. Had no idea what cream tea and clotted cream are, so I looked them up in Wikipedia. So English! Would love to have it sometime and being shown how to consume it properly. Always happy to learn something new.